You happen to be standing at a switch that can turn the train onto a spur. Alas, that, too, will mean death, but only for a single man who’s tied to the tracks. Do you pull the switch, ending one life to save five? Most people say they would. Now imagine a similar scenario but this time you’re standing on an overpass looking down as the trolley approaches. There’s no switch, but there is a very fat man standing alongside. You realize that if you push him over, he’ll fall on the track and his weight is enough to block the trolley, saving the five men tied down. Do you push? Most people say no. Why the difference when in both cases five lives will be saved at the cost of one? Several reasons, Edmonds suggests. In the first instance, you don’t intend to kill the single man, that’s just the consequence of saving the other five. It’s even possible the single man will somehow manage to free himself in time to escape. In the second, you do intend to kill the fat man. He must die for the plan to work. Plus there’s the actual act of pushing (murdering) the fat man. So in the end, for most of us, emotion trumps reason. But for Edmonds that’s just the beginning. He offers all sorts of variations and permutations and examines how the problem changes with each. For example, does it matter if the single person on the spur is a child? Or your mortal enemy? Or if the five men on the main track are all over eighty? What if the setting is changed to a hospital and you’re a surgeon who can kill one innocent man and harvest his organs, thereby saving five other people? What if the man is on life support with little hope of recovery and time is short for the other five? The book becomes even more interesting as Edmonds brings in the major ethical theories. Bentham, who believed in the greatest good for the greatest number, would have no problem killing the fat man, but Kant, who believed if murder is wrong in one instance, it’s wrong in all instances, would come down on the other side. What’s intoxicating about this book is that every time you think you know what you think, Edmonds tosses out a new element—adding for example, the results of a study in which participants were shown either an hour of television comedy or a serious drama before being given the trolley problem. Those who watched comedy were far more willing to push the fat man. (They’re also far more willing to do so when those tied to the tracks are all animals instead of people.) What are we to make of that? There’s lots more to enjoy and learn from this book, a real gem and one of my new favorites. You can also get a taste of the book by listening to or reading the transcript of an interview with Edmonds on Philosophy Bytes. 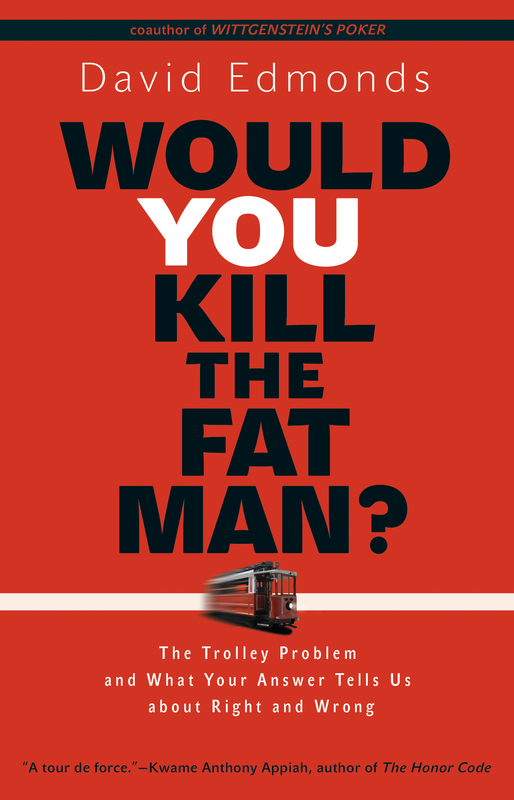 Would You Kill the Fat Man? The Trolley Problem and What Your Answer Tells Us about Right and Wrong. By David Edmonds, Princeton University Press, 2013, 240 pp. This entry was posted in Book Reviews and tagged ethics, medical ethics, practical ethics by Mark Willen. Bookmark the permalink. I have a lot of trouble with the notion of the greatest good for the greatest number. It’s a prescription for destroying the weakest among us. Republicans, for example, would get rid of the safety net because a majority don’t need it. So I wouldn’t interfere with the train. I let fate kill the five guys in this instance. I don’t think there’s any good answer to the trolley problem. Thank goodness it’s a hypothetical and a pretty unrealistic one. I can see a rough parallel to the organ transplant case, but a lot depends on the health and prospects of the patients involved. If donor is healthy, you can’t kill him. Period. End of discussion. Every moral decision implies the construction of a detailed rule that matches the circumstances, such that the rule could always be applied when all the relevant factors are the same. When the rule is summarized into a principle, then we lose detail, and the principle offers general, but incomplete guidance. The switch case, with no option but to kill three or kill one, would likely apply in situations that boil down to either one must die or many must die. The fat man case is different, because it is not the case that the one must die at all. Same with the involuntary sacrifice of one person to provide organs to several. Both would be rejected. A rule is not only judged by its immediate effects, but also by its effects if applied generally and repeatedly. If it were okay to kill to get multiple organs, then many people, perhaps you or someone you love, could be sacrificed against your will. Means are also ends. Terrorism is extortion by killing the innocent. If the rule is valid for one side then it is also valid for the other. The end is Hell on earth. The goal of morality is the best possible good for all. It cannot be merely the best for the most. No Philosopher is right that “greatest good for greatest number” can be taken to extremes, but so can any theory. In fact, it works most of the time and makes the most sense. I can’t see how killing five people is more ethical than killing one, and that’s the choice. It’s not the greatest good for the greatest number. It has to be the best possible good for everyone. The “best possible good for everyone” might be operationally defined as a condition in which good were optimized such that no one’s good could be improved without lessening someone else’s. Of course, lacking a “God’s eye view” of ultimate outcomes, we are always estimating the choice that will produce the most good and least harm to everyone. And that’s why two good and honest persons may disagree about the best choice, because one sees future outcomes differently than the other.